With the release of iOS 11.4.1, Apple has finally rolled out a new security feature designed to protect your devices against USB accessories that connect to the data port, making it harder for law enforcement and hackers to break into your iPhone or iPad without your permission. 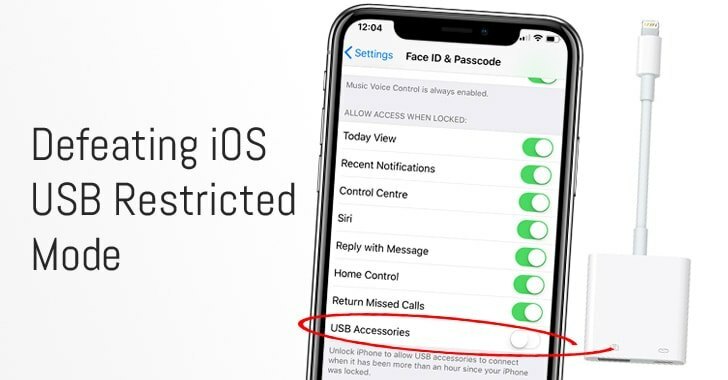 Dubbed USB Restricted Mode, the feature automatically disables data connection capabilities of the Lightning port on your iPhone or iPad if the device has been locked for an hour or longer, while the port can still be used for device charging. In other words, every time you lock your iPhone, a countdown timer of an hour gets activated in the background, which if completed, enables the USB restricted mode to prevent unauthorized access to the data port. Once the USB Restricted Mode gets activated, there’s no way left for breaking into an iPhone or iPad without the user’s permission. The feature would, no doubt, defeat law enforcement’s use of special unlocking hardware made by Cellebrite and Grayshift from attempting multiple passcode guesses via the iPhone’s Lightning port. However, security researchers from ElcomSoft have found a simple way that could allow anyone to reset the countdown timer of USB Restricted Mode to effectively defeat the purpose of the new security feature. According to the researchers, by directly connecting a USB accessory—such as Apple’s $39 Lightning to USB 3 Camera adapter—to a targeted iOS device within an hour after it was last unlocked would reset the 1-hour countdown. Activation of USB Restricted Mode can also be prevented even by using untrusted Lightning accessories, or those that have not been paired with the iPhone before. “In other words, once the police officer seizes an iPhone, he or she would need to immediately connect that iPhone to a compatible USB accessory to prevent USB Restricted Mode lock after one hour,” Afonin explains. ElcomSoft researchers are also experimenting with unofficial and cheap Lightning to USB adapters to see whether they, too, can extend the one-hour time limit. The issue doesn’t seem to be a severe vulnerability and looks like just a mistake on Apple’s part—”probably nothing more than an oversight,” and we hope that Apple would patch it shortly. In case you feel the need to immediately activate this USB Restricted Mode feature on their iOS devices before the countdown timer ends, just press the Power button five times.